Description: This Biltwell parts combo includes everything you need to replace the enormous Model-A style taillight on most aftermarket plate/taillight brackets. The footprint of our taillight is the same as the mounting surface on Model-A repops, but its scale and proportion looks much more at home on lean, stripped-down choppers. 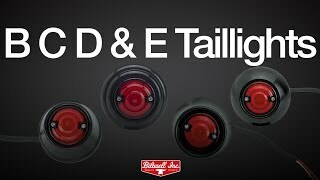 Fitment: Like every other taillight in the Biltwell line, our assembly is a custom accessory, and does not retrofit to any stock H-D wiring harness or taillight bracket. If you have basic tools and customizing skills, installing the Model C assembly on your Model-A style aftermarket taillight bracket is easy. For advanced chopper builders and home fabricators, we also offer two weld-on brackets and one bolt-on bracket to solve a variety of custom applications. See photos attached for finished assembly on a variety of Biltwell and aftermarket brackets. Construction: CNC lathe-turned 6061 T-6 aluminum light housing; extra thick injection-molded polycarbonate plastic lens with 5-40 Phillips head mounting screws; die-cut rubber internal LED spacer gasket; custom 15-element LED board with two phases (brake light and running light) and three wires (ground, brake and running lights); two 1/4-20 button head Allen bolts for mounting on Biltwell custom fender bracket (sold separately) or existing Model-A style taillight/license plate brackets.